The leader of the militant US nurses' union National Nurses United, Bonnie Castillo gave an inspiring speech at a well-attended Sunday morning The World Transformed fringe meeting in Liverpool on September 23, organised by NEON and Health Campaigns Together. This is what she had to say. Greetings from the land of the train wreck, which is about the most polite way I can refer to our present government in Washington. I am especially pleased to be here with you today, among my global sisters and brothers who are working every day for a more just, humane world based on equality, respect for human dignity, and a quality life for all. And, how refreshing to be in a country that is celebrating 70 years of a rational, humane, health care system, one that is not based on profit. We have a very different reality, of course, in the United States. We're Number 1! -Well that is in what we spend on healthcare - far more than any other country. We are also Number 1 in per capita deaths from preventable disease or complications. It's no wonder - in the US 40 percent report they haven't had needed medical treatment, tests, or doctor visits, due to high costs. We are working to change this -to break the grip of the for-profit healthcare industry and join the rest of the developed world with a more humane health care system. And, we're gaining ground. Today, in part due to the activism of millions of Americans, especially young people, a majority of Americans now support a guaranteed national healthcare system, Medicare for All. With November's major election approaching Medicare for All has become a defining issue. Surprising upsets have recently been won in primary elections by Medicare for All candidates. Medicare for All Bills now have more co-sponsors than ever before - and we have the formation of the first ever Medicare for All Caucus in the US House of Representatives. Meanwhile the acolytes of our broken healthcare system, with the help of establishment Democrats, Republicans, and the corporate media, are labouring feverishly to discredit this effort. Ultimately, I am confident we will win. I'm proud to say that nurses, and National Nurses United in particular, have played a major role in building this movement. For nearly three decades we have been helping patients and families harmed by our broken system to tell their healthcare horror stories to the public. We've also sponsored legislation, ballot initiatives, and been a force in the political arena and media on our signature issue: Medicare for all. Now we are doubling down our boots on the ground - building an army of people to build enormous pressure for Medicare for All. The landscape for this organizing has never been more promising. To build the broad-based movement we need to pass Medicare for all, we are engaging in a massive, national door-knocking, crowd canvassing and phone banking campaign. These conversations focus not on policy but on humanity and morality. The failure to provide healthcare to its citizens by the richest country in the world is not a failure of policy - it's a moral failure. In California we successfully passed a single payer bill through the State Senate - only to see it get stalled by State Assembly Democrats acting on behalf of their corporate healthcare donors. So we went around them, to their constituents, and found how out of touch these Democratic politicians are. We knocked on tens of thousands of doors, called though entire district lists and ID'd single payer voters throughout the state. This is the model we are deploying nationally. And we are coalition building with community allies- activating the work of the grassroots healthcare activists in our movement. Our communications campaign is robust, from social media to traditional media and everything in between. We are internationalizing this fight and joining forces with broad-based movements such as in Canada in the fight to include pharmaceutical coverage, and here in the UK to protect the NHS from privatization. We stand with you in your fight to protect the NHS. Your fight is our fight, and you can count on us to help in any way we can. What we know is that all of us - across the planet - have common interests, and a common fight. That's why five years ago, we joined with nurses around the world to form Global Nurses United - now based in 25 countries. We came together to oppose neo-liberal policies such as privatization of public services, and to improve living standards for all the world's peoples. It's impossible to over-state the importance of these bridges of international solidarity. The international right wing wants to divide us. They have the money, their politicians, and their media: but we have people power. For nurses, it begins with guaranteed health care. We are committed to working together, and so proud to be linking arms with you today. 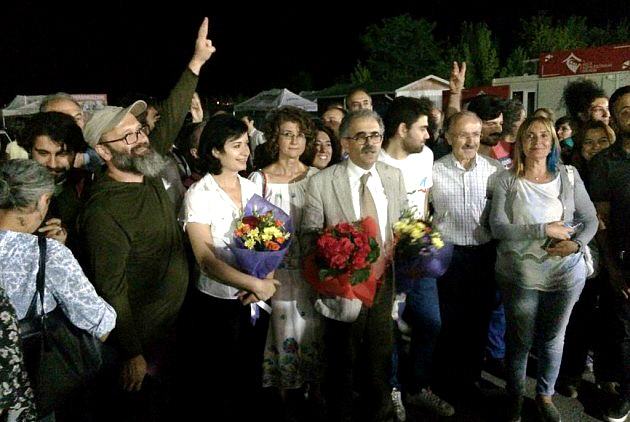 “On July 19th, the physician and professor Onur Hamzaoglu, known as “Haka”, “Teacher”, was set free, after 150 days of detention in the highest security prisons of Ankara. He was arrested at the beginning of February for signing a solidarity call for the people of Afrin [Syria], demanding Turkey’s war operation (“Olive branch”) to stop. A professor of public health, director of a medical journal and researcher who developed protocols for the treatment of leukaemia, Hamzaoğlu is a man very annoying for the regime. He was expelled from the university in 2016, along with thousands of others who became known as “University for Peace”. An international campaign had been waged to free him. Health Campaigns Together was among the organisations which shared this appeal for an international campaign in support of Hamzaoğlu who had been victimised, jailed and brought to trial under the repression of the right-wing Erdogan regime. Watch World Bank President Jim Yong Kim say user fees from the sick are the least efficient and inequitable way to finance a health system. It’s only taken the Bank 30 years to get to the conclusion many campaigners around the world knew in the first place! Read this belated common sense here. What does a Doug Ford victory mean for health care? Canadian campaigners beat cuts and privatisation - A letter from Ontario Health Coalition Director Natalie Mehra to the first AGM of Health Campaigns Together. The Ontario Health Coalition continues to fight cuts and privatisation across the vast province, with elections for the provincial government due for next June. Check out their website. In Ontario, where the austerity has lasted longer and inflicted even deeper cuts into hospital care than England, campaigners from the Ontario Health Coalition attempted to influence a 3-way race in elections for the provincial government. Demanding Health For All, a hard hitting new video – very timely given the approaching 70th anniversary of the NHS – has been issued by Public Services International, the Geneva-based world-wide alliance of public sector trade unions. It features PSI’s Baba Aye. “The struggle for Health: an emancipatory approach in the era of neoliberal globalization” edited by the Rosa-Luxemburg-Stiftung, Brussels Office. You can download the pamphlet from the Rosa-Luxemburg-Stiftung website, or from HERE. The Struggle for Health, a new pamphlet on the fight for health care in an age of neoliberalism, has been produced by Sebastian Franco of the Rosa Luxembourg Institute in Brussels. Download here. The European Public Service Union (EPSU) brings together unions representing 8 million workers across the continent, and stands against austerity, cuts and privatisation. They have a website here, and a (relatively dated) overview of changes in European health systems here. EPSU also supports the European Network against privatization and commercialization of Health and Social protection, which holds conferences and organises an annual Europe-wide mobilisation on April 7 each year. The Network is building an online database of privatisation. See its website here. International Association of Health Policy in Europe (IAHPE) is holding its 18th Conference in Thessaloniki, Greece on September 21-24, supported by an impressive range of organisations from Europe, the Americas and Asia. Its blog, with links to the Conference are here. 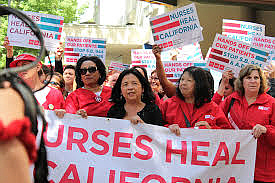 Blog by Bonnie Castillo, Union Nurse Leader & Medicare For All Activist. Executive Director of @NationalNurses, the Largest U.S. Organization of Registered Nurses. Physicians for a National Health Program (PNHP) have been battling for the replacement of the costly, wasteful and exclusive health care system with a publicly-funded 'single-payer' system that would cover all Americans. They are gaining ground as the fight goes on against Donald Trump's plans. Their website with a wealth of information on the US health care system is here. April 7 each year is a day of international solidarity against privatisation. For the last few years this date has not worked well in England, but a network of campaigners have taken up the fight. Click here for a short video promoting the idea.